The company is engaged in manufacturing, supplying, and exporting of Prietest Touch Biochemistry Analyser. Our comprehensive range of Prietest Touch Biochemistry Analyser consists of Prietest Touch Biochemistry Analyser and Prietest Easylab- Biochemistry Analyser. The Prietest Touch Biochemistry Analyser, provided by us, is widely demanded in Chemical Industry for analyzing the quality of chemicals. 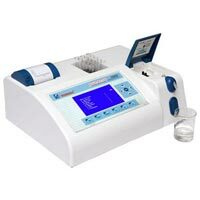 Moreover, we provide Prietest Touch Biochemistry Analyser at the market leading prices.